As a green juice addict I was excited when this delivery came to my door ~ twenty eight bottles of cold pressed juice. While I was in the USA in June I loved the fact that fresh cold pressed green juice was so easily available. You could find green juices in Whole Foods, corner shops, coffee shops and there were even actual juice only shops! Heaven. I know these are more easily found in London but in Bristol they are few and far between. I am a huge fan of making my own green juice but for convenience it is often good to have something fresh and healthy which you can grab out the fridge and run. As you know I have been working at my office job during the day and running around to yoga classes, teaching and practising in my spare time so these have been a great way to make sure I am getting in my nutrients from fruits and veggies. Cold pressed green juice is the result of vegetables and fruits which have been pressed and squeezed without the involvement of any heat or pasteurisation. It results in green juice which is 100% fresh, 100% raw and 100% healthy. Drinking juice is a great way to help to balance your weight, detox after over indulging a little and fit into a healthy lifestyle. I also find I have more energy when I get in my daily green juice. Personally I love the green juices with lots of green vegetables in but if you are just starting with juices the beetroot and carrot based juices are a great place to start. However I think that making green juices yourself is the best way to go as all it takes is a little effort to make up a batch. 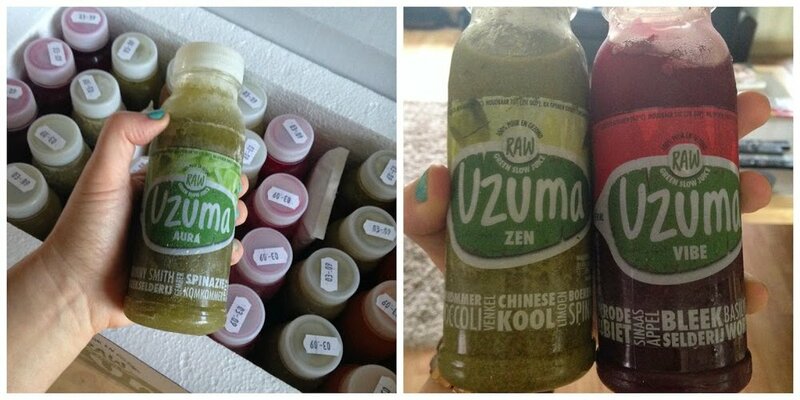 I liked the green juices from Uzuma but personally I wouldn't purchase them myself as I prefer to make my own. You can find out more about Uzuma Juices and the packages available to be delivered straight to your door. The Uzuma Juices were sent to me for my consideration. All views are my own honest opinion.